I didn't see K3, so it may not have run. It was allocated 20121. Next eastbound was K4 with 37572 which was 22 late. Bruce had seen K5 going to Peterborough just 5 late, but 37578 was 39 late coming back. Through services from the coast were naturally badly affected. The first run, Y6 was 37579 and this was 56 late from Wisbech departing about 80 minutes after K5. Returning 37579 was 68 late on the Y6 timings, but to fill the big gap, King's Lynn sent 37160 empty to Wisbech (via the villages strangely) to then run as Y6 10.26 Wisbech to Lowestoft. 579 then graduated to become Y7. 37574 on L8 was sufficiently late on arrival at Lynn to become Y9 and left for Peterborough at 10.00, 15 late on its new schedule. Conditions made it 21 late at Wisbech and 22 late coming back. L10 was the first service to run 'normally' with 37570, just 12 late over the western section. This wasn't the end of the disruption though as L11 terminated at Wisbech and 37566 was spotted by Bruce with its driver enjoying a sandwich before resuming his duty as the 12.56 to Lowestoft. L12 had a demon driver and 37157 was 6 late going west and only 2 minutes down coming back. Passengers who missed it then had a 56 minute wait for 37564 on Y13 which was 32 late and had 37568 on K14 on its tail, just 6 minutes behind. K15 had begun the day with 37577, but a late arrival at Lowestoft saw it then slip a turn to become K16. The vehicle inserted was dear old 20107 which then found itself on K15 which is a top B9 turn. There were numerous other swaps of course﻿ and K17 didn't run at 13.45 from Lynn to Peterborough. Instead 37567 ran empty from King's Lynn to Wisbech to take up the turn at 15.56 to Lowestoft - thanks to Bruce for this who saw it ariving empty on the Churchill Road. By this evening things had eased a bit, but 20121 found itself on K4 18.10 Peterborough - Lowestoft as far as Lynn, there should be a video for you to see below. 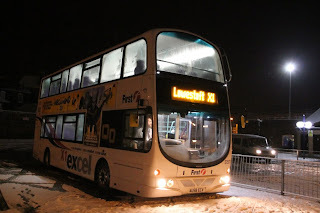 I'm not sure what replaced 20121 and I think the 19.35 to Lowestoft had already left by this time (nearly 20.00). An accident in treacherous conditions on the old A47 near the 'Coach & Horses' flyover at Tilney at 19.30, saw Y6 19.10 from Peterborough take the A47 dual carriageway to avoid the obstacle. Just as remarkable is the fact that 107s nickname began when it was extremely noisy, yet these days it would be difficult to find a quieter vehicle. 107 positively purrs along, less noisy even than a Gemini ! Recent messages on the EABG question the reason for the continued use of 107, when much more recent coaches are being sold off by 'First'. The explanation can only be its reliability one feels. Thanks to Des for the picture & video. Just for the record, 576 has now worked on 66 days. The record stands at 68, BUT, today 576 was removed at King's Lynn because of a water leak and 37565 completed the turn, this must cast doubt on 576 appearing tomorrow, but you never know ! My Saturday at work with me observing passing buses, as Bruce was otherwise engaged. King's Lynn sent out 20107 on K18, 37570 on K19 and 37157 on K1. Michael Bryant reports 37157 and 20107 being in Norwich simultaneously at 13.50 and with no sign of 37570. At this end 20107 passed through on K18 5 late this afternoon and 37157 was now on K19 marginally early. K1 had 37567 supplied by Lowestoft and was 7 late. Later 37578 off K17 was in King's Lynn depot, presumably something else replaced it to work the 16.32 to Lowestoft. Early snow saw 37571 on K2 being 15 late on the 07.35 Peterborough to Lowestoft, but the defecit had been reduced to 7 minutes tonight. 37563 on the 08.35 was on time, but 37160 on K5 09.05 was 13 late. Y7 10.05 from Peterborough was 17 late through Wisbech. Snow and ice contributed to some disruption this morning. Westbound X1 services from the coast began alright with Y6 and its trusty beast (20107) being just 12 late. Y7 with 37563 was driven by Des and his journey log is reproduced here : "Light slushy snow on ground, but heavy snow falling to Norwich, depart 5 late (06:55) - From Easton to Little Fransham, 3-4 inches of hard packed snow/ice on all roads, did not seem to have been gritted at all. 9 late@ Dereham, 45 late @ Necton (08:35), 43 late @ Swaffham (08:45) arrive Lynn 42 late (09:21). Looked like a 7.5 ton truck had been recovered from north side of A47 at end of concrete carriageway, Beeston turn. 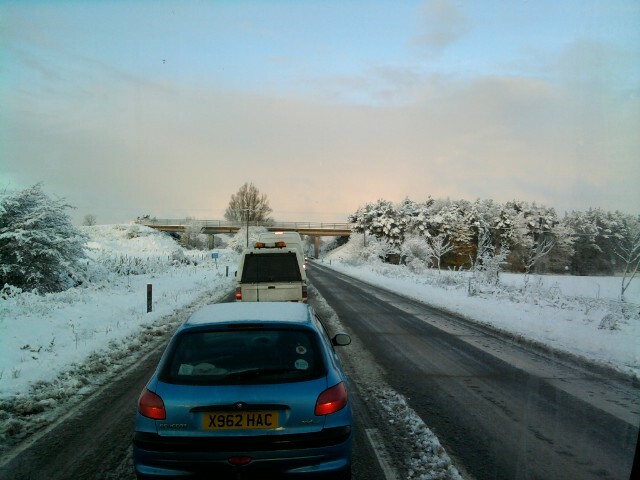 The A47 west of Dereham this morning with queueing traffic amidst the picturesque conditions. ﻿ With 37563 arriving at King's Lynn 42 late, L8 following was also late with 37568, so Lynn produced 37158 to run in the path of L8. 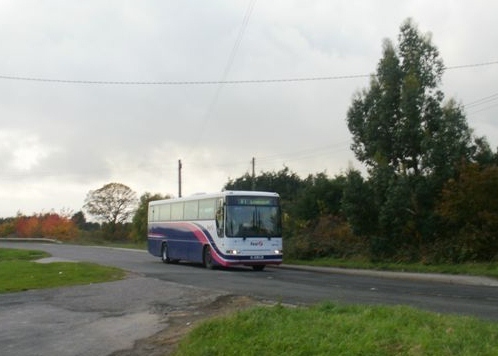 158 was seen leaving Wisbech 2 minutes late, but full due to the non-appearance of Y7. With 37158 now on L8, Y9 which had started with 37157 had 37568 take over at Lynn. This was 9 late passing Bruce, but just 5 late coming back. Meanwhile Y7 with 37563 ran empty to Peterborough before forming the 10.05 to Lowestoft on which it was 13 late arriving in Wisbech. Not bad considering it had earlier been 42 late. 37572 on L10 was replaced by 37157 (off Y9) at Lynn, then L11 with 37573 ran through. This left 37572 spare at Lynn and it then worked L8 12.02 to Lowestoft. 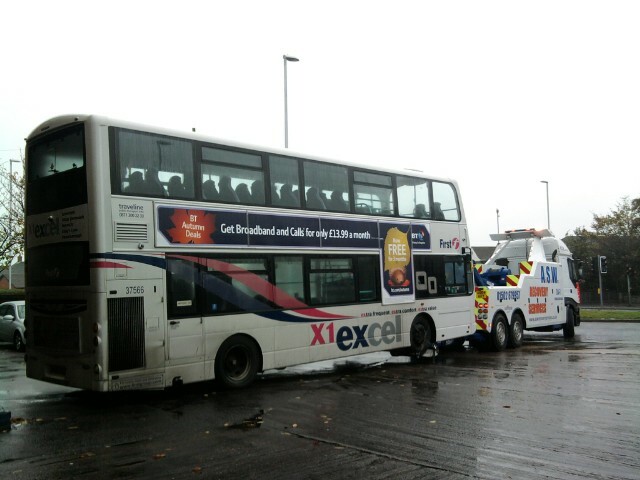 The vehicle arriving on L8, 37158 was returned to its local work. Somehow this evening, 37157 ended up on Y9 with 37568 on L10. Other swaps today involved K16 having 37156 removed at 13.07 at King's Lynn being replaced by freshly serviced 37579. The snow relented today, but the low temperatures caused problems. The 'Beast' on Y6 was failed before working the 20.35 Lynn to Lowestoft as it had no windscreen washer water. 37573 off L11 worked forward. 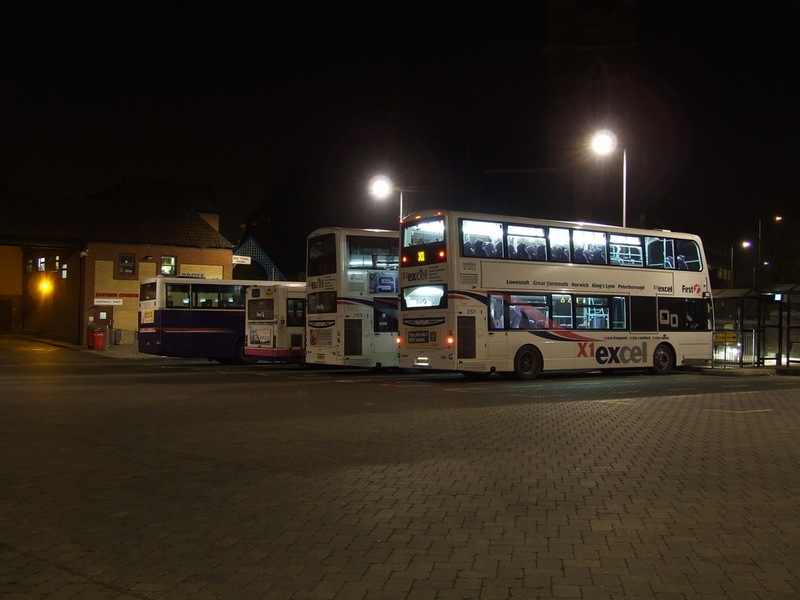 This handheld picture is quite blurred, but shows 20107 after being taken off Y6 tonight, together with King's Lynn's sole remaining Dart 43468 on the depot frontage. 20121 was not available for K3 today and instead this turn was worked by 37160. 37567/9 were absent from the X1. K2 had 37574, but Sam saw this heading empty up the A146 from Lowestoft to Norwich, where presumably it worked forward as the 13.55 to Peterborough. Sam also reports a B9 Gemini on the X2 early on and this is believed to have been 37567. Punctuality suffered again this morning as yet another accident on the A47 caused delays. This time the collision was near Thorney and whilst services going west were leaving Wisbech pretty much to time, the return eastbound services were not. 37568 on Y6 was first service to be affected, it was 16 late and things worsened then with 37565 on Y7 being exactly 30 late and L8 with 37157 39 late, Some misfortune befell 37578 on L10 as this managed to be 20 late leaving Wisbech on the 10.48 to Peterborough. Things had pretty much righted themselves by early afternoon and 37576 on Y13 was bang on time with the 13.05 Peterborough - Lowestoft. The Beast was used on K18 today which is fairly unusual, as this is more often than not a B7. 20121 was K3 as expected. Des drove it from Lynn eastbound and was 9 late departing at 09.41, however, all lost time had been regained by Norwich. 37567 was off for servicing today and one of my spys informs me that 37569 is at Volvo being attended to. Peter sent me a text as Angela was concerned that I was three days behind with the blog. Sorry Angela !! I was stocktaking at work today, but managed to see most of the daytime X1 services. The most unusual thing I saw today was at 14.30 when I went to the Horsefair to get milk and mince pies. Sitting in the bus station looking abandoned was Royale 34108. Andy James says it came empty from King's Lynn at 13.50 (see his picture of it departing below) and later worked K16 15.26 Wisbech to Lowestoft. To explain its appearance, K14 was 37564 which Cheryl remarked yesterday was sounding like a roadsweeper. This was taken off at Lowestoft and 34108 took its place. K14 is due off Lynn for Peterborough at 12.15, but (I expect because of late running) it never ran. K15 was on time with 37574 and K16 with 37156 was about 15 late. 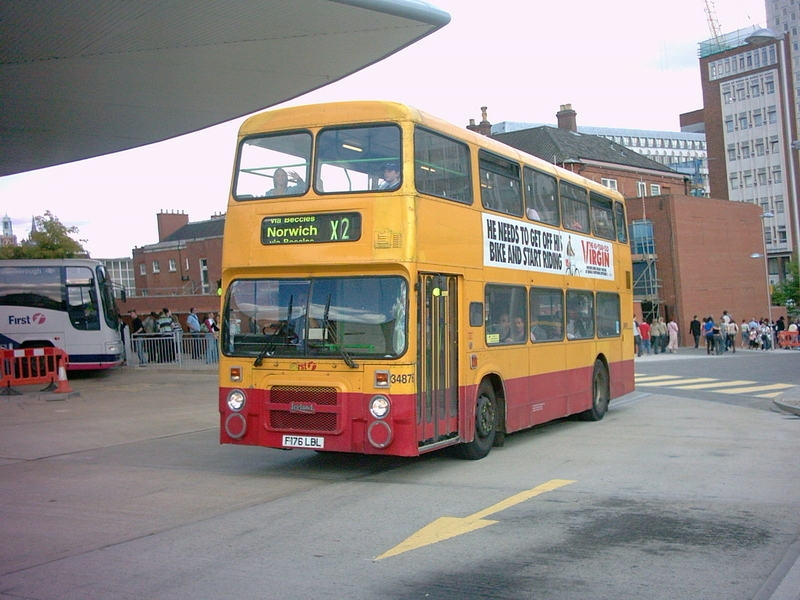 The B7 is thought to have travelled empty from Peterborough to Lynn and probably then on to Lowestoft eventually running in the times of K14. No other services seemed to be affected by the delay, but there was another A47 fiasco this evening near Swaffham at around 17.20. Both Y6 and L8 which depart King's Lynn at 17.45 and 18.50 to Peterborough were delayed and neither ran through to Peterborough. Instead 37159 was called upon and this ran as a late Y6. Both 37578 and 37576 resumed their duties on the 20.35 and 21.35 to Lowestoft. B10Ms 20107 and 20121 worked Y7 and K3 respectively. 37571 now has an advert affixed to the offside for the first time following the fitting of the necessary studs. Only 37569 of the B9 fleet didn't appear on the X1 today, but there were still some substitutions nevertheless. 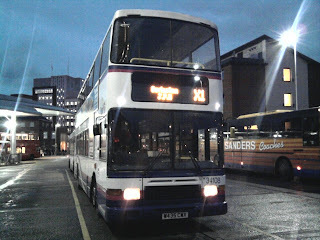 The Beast appeared on K1 this morning having stood in for 37577 on K17 last night. The B10M coach worked all day and so did 20121 putting in another 315 miles on K3. 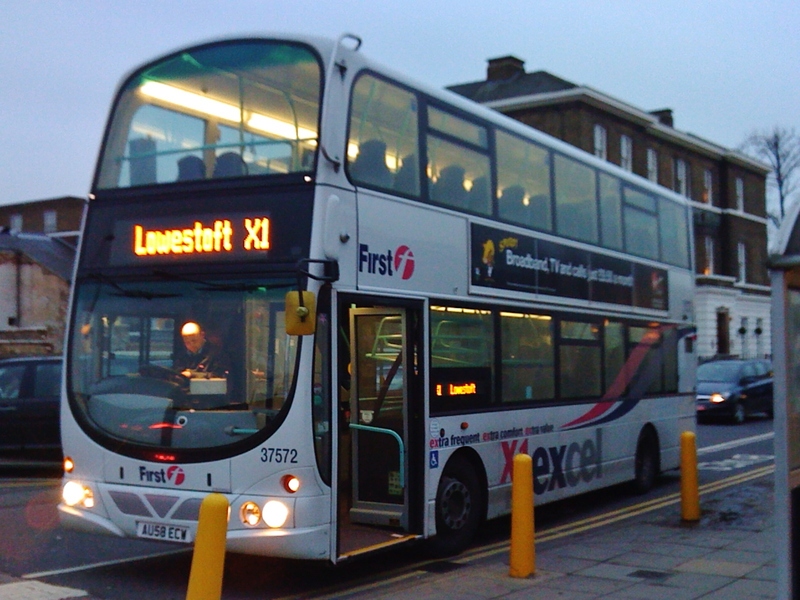 K14, the first eastbound service from Lynn which returns as the 08.55 Lowestoft - Peterborough was Royale 34108. Grahame Bessey was in King's Lynn today and sent this nice study of 34108.The Sky HD advert was new overnight. The three King's Lynn based B7 Geminis were all on town work today, but 37160 did a quick trip to Peterborough and back on Y13 after 37564 was (I assume) late arriving for the 11.45 departure westbound. 37564 resumed the turn with the 14.32 to Lowestoft. One of Lynn's new Solos requires a new gearbox already and with two Volvo B7 deckers also sidelined, this has meant the B7 Geminis have been required locally. K16 had a Lowestoft maintenance swap with 37157 being replaced by 37566. Y9 also changed vehicles at Lowestoft with 37579 being replaced by the recently absent 37568. Tthere was major disruption on the A47 this afternoon, when a multi vehicle pile up between Thorney Toll and Guyhirn saw some services diverted via Parson Drove and Throckenholt. 37565 on K2 15.45 Lynn - Peterborough and 17.35 return was so late that 37577 which had come into Lynn on Y7, was turned round to go back to Lowestoft at 18.32. Captured by DS at the rear of Caister Road garage is 20123. It still has the '2' on the blinds following its final run on the Hunstanton schools. A quite ordinary day on the X1 was overshadowed by the looming Tuesday meeting of all the top brass to discuss the X1 future. Now this is top secret of course, but as six people have now told me about it, I think mention may be made of it here. Interestingly, all six people have told me different things which are 'likely' to happen, so I guess we'd better wait until these are made public and for those of you involved in the discussions, good luck ! One thing which will no doubt feature in these talks, is the inability to provide a totally low floor service. 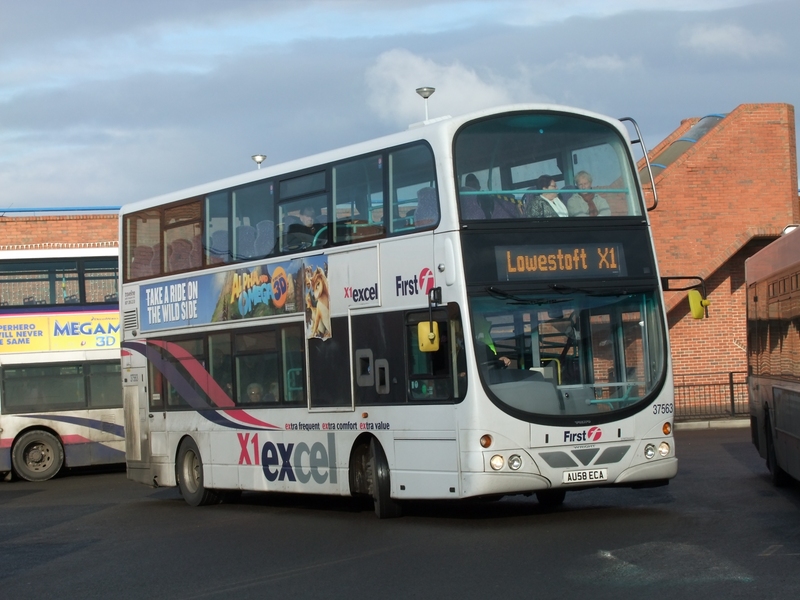 Today 20121 was its usual magnificent self on K3 and 34108 was sent out by Lowestoft on L11. One bi-product of this was the unusual sight of 37158/59/60 all on King's Lynn local services. I passed K18 at Thorney this afternoon and 37564 is still making a horrendous racket. It just can't keep away. 20501, or Robbie to his friends, stands in the depths of Caister Road garage. 37575, the highest mileage and therefore by virtue, the most reliable B9 Gemini about to set out on another day's work at Great Yarmouth garage yesterday. The old and the not so old at Great Yarmouth Caister Road on Sunday morning. Further to our recent photographs of 34876, David Oakley has kindly sent a picture of the venerable lady taken on 29th September 2007 during her last days on the X2. All B9s again today and running on time too it would seem. 37568's last X1 appearance was on the 10th November and 37569 is sidelined at Yarmouth and hasn't been out since Wednesday afternoon. With this then, it may come as some surprise to learn that quietly in the background, 37576 has been making up some of its lost mileage and has now (today included) been out on the X1 for a total of 59 consecutive days. The current record stands at 68 days, set by 37574 in October last year, so we will see if 576 can beat that in the next week or so. Over the 59 days incidentally, it has run almost 23,000 miles ! 20127 Engine seized but should have a good gearbox!!! 20131 Good engine and gearbox but body rotten. Another unexpected arrival at Yarmouth is Paragon 20501 as 'spare'. Spare for what I wonder ? I know I often harp on about the huge mileage amassed by the X1 buses, but it surely must be unique amongst long distance stopping services. Today 37575, the number one B9, passed another milestone, if you'll pardon the pun. 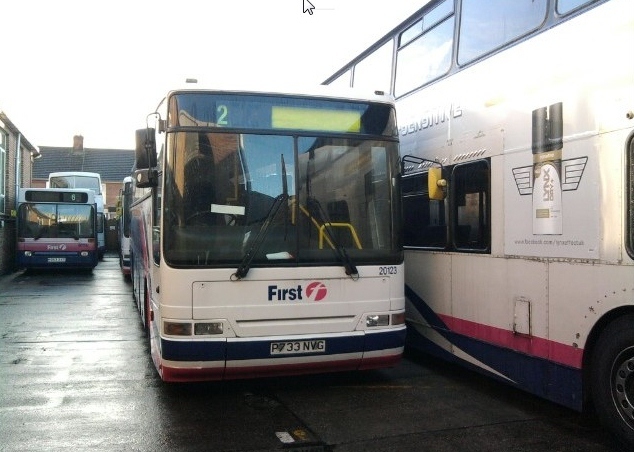 It has now done over 250,000 miles since it entered service on the route on November 12th 2008. If anyone can quote a greater mileage for a bus in a two year period, I will be very surprised. Oh, and just in case you thought it was exceptional, take our old friend 'The Beast' 20107. She entered service in August 1995 - yes over 15 years ago - and in the 8 days up to yesterday (it didn't work on Sunday) had run up 2,500 miles. What can one say except, what a beast !! Today 20107 had to be taken off the road for its scheduled safety service, so having worked K1 from Lynn to Peterborough and then back to Lowestoft, it was there replaced by 34108. Now in case you are wondering, 37568/9 should have been about, but obviously neither was fit to replace 107. Fridays, as regular readers will be aware, can be disastrous for X1 punctuality, but today was fairly good. Daytime services were pretty much to time, save K17 with 37575. Due off Wisbech westbound at 14.18, it ran almost 15 late and this coincided with K14 running eastbound 15 late. This was 37564, so was heard well before it actually appeared due to the fan silencer or whatever it is that is malfunctioning. 20121 and 37571 were off the road for servicing at Lynn today. 37578 was also serviced here, but was ready in time to work K5. Peter had a trip out to Nottingham today and travelled outward to Peterborough with 37578, however, his return from Peterborough at 17.40 was delayed as K3 was 20 late with the driver divulging that the A47 was 'shut at Wisbech'. While this didn't seem to affect all services, K1 was definitely involved. 34108 was very late arriving back at Lynn and instead the 18.02 to Lowestoft left with 37571. 34108 then retired to a rather congested Vancouver Avenue where the bus washer was out of order on this muddiest of days. 37567 off Y7 was also present, but with a damaged nearside mirror making manouvreing awkward in the garage confines. Many thanks to Andy James for this picture of 37158 which was enjoying a break from the X1 today. It is seen here at Winston Churchill Drive on Fairstead Estate with King's Lynn town service 42 in today's foggy conditions. I digress however, the morning went well with X1s passing through Wisbech being pretty near to time. Latest in fact was 'The Beast' on L11 which was 13 late westbound. Around about the time we were enjoying a Wetherspoons lunch, a lorry broke down on Guyhirn bank and Y13 with 37579 was 22 late heading back to Lowestoft on the 13.56 from Wisbech having travelled via Wisbech St. Mary to avoid some of the delay. 34108 was also affected and was 17 late in from Peterborough, having stuck to the normal route. With a 25 minute late departure from Lynn, it had made up 10 minutes by Norwich but then became embroiled in the Norwich Christmas lights traffic - they were turned on this evening, so was 20 late at Great Yarmouth, where our man disembarked for his curry. I wonder if they issue Wetherspoons loyalty vouchers ? 20121 was on K3, noted 9 late this morning, but only 4 late this afternoon. Sam reports 37156 on the X2 this afternoon. Wednesday 17th November 2010 ~ Bruce Restored ! The day seemed to pass without major incident and 20107 was on premier duty, working Y6 while 20121 worked K3 again. The reliability problems which beset 121 a couple of years back, now but a distant memory as it continues to clock up the mileage at the expense of the unavailable B9s. This weeks absentee appears to be 37568 which has not been seen since Michael viewed it on the X2 last Friday. Apart from 568, the only other B9 not on the X1 today was 37565, stopped for its scheduled servicing. 37571 started the day on Y9 having found itself at Yarmouth overnight, it had later graduated to L10, a turn which started with 37569. Y9 meanwhile was worked from Lowestoft to Lynn at 15.55 by 34108. All three King's Lynn based B7 Geminis were at King's Lynn today, but 37156/7 were in use on K16 and Y13 respectively. Having said that, Bruce reports K16 with an unidentified B9 this afternoon, not surprising as 156 was due a safety service. B10M coach 20126 was seen by Michael Bryant at Haddiscoe on a schools trip this morning, he was in the area to photograph a couple of Class 31 diesels on a gauging train (or similar). I'm pleased to report that I received my car back at lunchtime and it is good to have it back after £3700 of repairs. In glorious sunshine at lunchtime, 37575 heads out of Walton Highway on K15. Bruce and his family went down with a malady yesterday, so his usual valuable sightings have temporarily dried up. Fortunately though, I managed to see all the X1 turns which were thrown into chaos around teatime by an A47 incident at East Winch. The Beast manifested itself on K1 this afternoon, meaning that at some stage either yesterday or today it replaced 34108. 37571 was out on K5 instead of its usual K17 turn, but the disruption this afternoon meant it ended up on L8 which sent it to Yarmouth overnight. Earlier in the day, L8 had been delayed and was 17 late on the 09.48 Wisbech - Peterborough with 37579. 37566 has again been absent and it is thought to have come off K4 at Lynn last night with 37159 working forward. 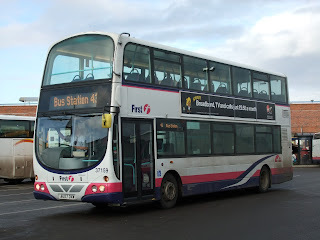 566 was certainly on the 18.05 departure from Peterborough yesterday as Peter was travelling on it. More fallout from tonight's A47 riot resulted in Y6 being seen at Thorney at 20.00, running 25 late with 37565. Y6 had been 37564 earlier and it looks as though 564 may have been stuck in a queue at East Winch while 37565 on Y7 took a diversion to arrive at Lynn first and therefore worked forward as Y6. Whatever happened , K5 certainly didn't run at 17.15 from Lynn to Peterborough. K3 behaved today with 20121. It was quite a foggy morning here, but visibility was good enough for me to note that K3 08.05 from Peterborough - lately almost always 20121, failed to pass by. Intrigued I monitored the Southgates webcam and didn't see it toddle off to Lowestoft on the 09.32 out of Lynn. Whatever happened I don't know, but at 16.08 20121 was viewed arriving at Lynn on K3 as usual. Very odd ! Another surprise today was 34108 turning up on Y9 this morning when 37567 had been expected. 567 itself worked L11. 37564 was back today and somehow managed to miss getting new adverts (along with 37563 & 37575) and so still has the broken milk advert. It worked L8 and could be heard from quite a distance due to its noisy fan. 37563 meanwhile was viewed by Michael on the 11.38 Lowestoft - Norwich X2. So a long list of numbers there... Des adds "Today I was mostly driving the 'Heritage Fleet'. 20107 - K14 08:55 Lowestoft - Lynn - Brake warning light/buzzer sounded for the nearly the whole of the Acle Straight. I thought 'I'm not stopping on the straight, I'll stop in Acle'. It ceased as I was approaching Acle. Whoever allocated this vehicle at this time should be shot! I left 12 passengers in Yarmouth and 7 in Acle. 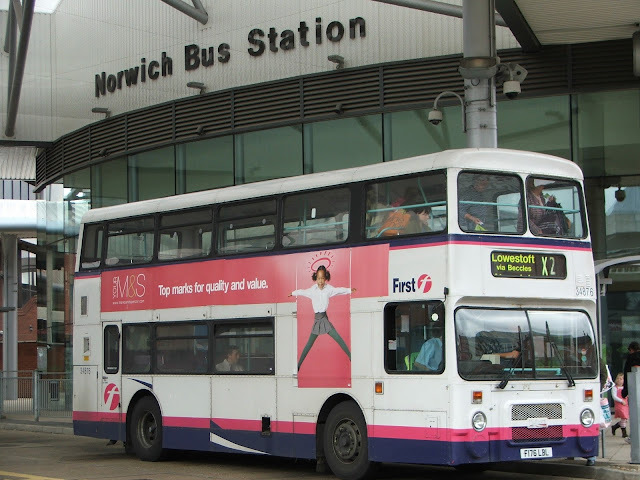 Next bus through to Norwich is an Anglian A47!!!! I received £1.70 and 5 sweets in tips for helping passengers with luggage, baby buggies and walking frames. Thank you all. Returning eastbound, 37570 departed 5 late from Peterborough rail station at 14:40, 2 late at Queensgate, 2 late @ Wisbech (15:28), on time by 'Boskoop' to see a cheery wave from the 'Walpole X1 Appreciation Society'. On time to King's Lynn...then, back to the vintage vehiclefest....34108 - K18 17:02 King's Lynn to Great Yarmouth - on time throughout". Our spy in Yarmouth says "20115 needs new gearbox so is parked out the back of the garage. Trainer 20128 has finished here now and is back at Norwich". Thew mystery of whether 20121 worked K3 on Friday deepens, as today it was off the road with a starter motor problem. 37566 was back on the X1 today after yet another spell on the sidelines. It is passing Walpole Highway on the 09.30 Yarmouth - Peterborough under grey skies. The 10.10 Peterborough - Lowestoft had 37567 today. 37572 at Peterborough rail station before departure as the 16.10 to Lowestoft. Photo from Tony Irle. Richard Alger was in the same area on Wednesday and actually found 37562 on the X1 ! Syd says "just a postscript to your comment about 34876 being used on X2. I have this early shot of her carrying the number whilst still in Yellow/Red livery and operating on the X2. The photographer isn't mentioned on the caption and I cant remember where it came from !". If you recognise this as your work, please get in touch, it's a great picture. Des says, my report today "37575 - Y7 06:10 Great Yarmouth - King's Lynn - on time throughout. Then Y9 37565 - 09:45 King's Lynn to Peterborough - on time (well... within a minute or two) throughout. After a break I worked 37578 on L12 - 14:02 King's Lynn - Lowestoft as far as Yarmouth. We were 7 late departing Lynn (14:09), 10 late @ Swaffham (14:44), 5 late at Dereham (15:12) on time by Norwich (15:55) and onwards. The Christmas tree was erected opposite the Kings Lynn Library today. I was disappointed to see 20107 & 34108 running one after each other, no low floor service for an hour!". Indeed that is true Des, 37563 worked the last leg of Y13 yesterday instead of 34108 which was poorly. 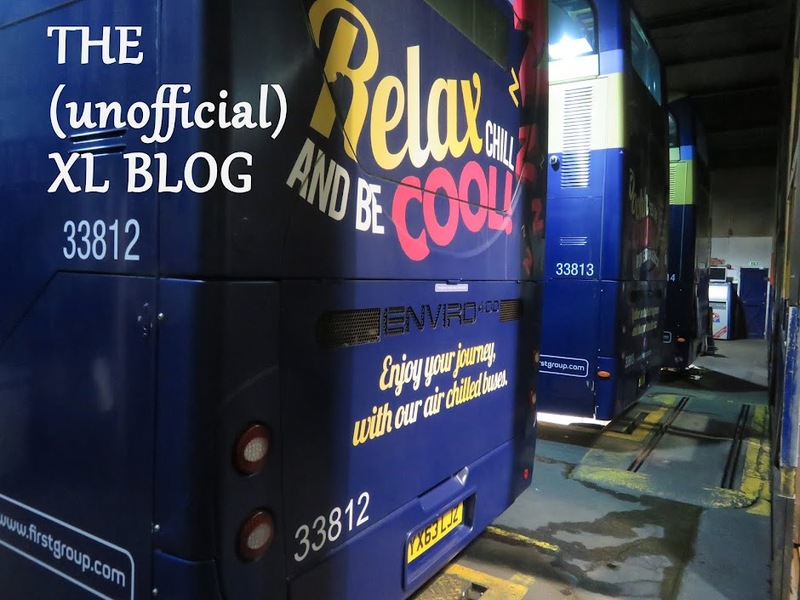 The Royale was fixed today and worked L11 which as you say followed 'The Beast' on L10. I followed the latter on the 22.00 Wisbech to King's Lynn tonight and she seemed to be going very well. I'm not sure if 20121 did K3 today or not, can anyone confirm this ? An unusual procedure occurred tonight when 37569 on K4 was removed at Lynn in order for them to carry out a service on it, as Lowestoft were unable to arrange this. Lynn's 37579 took over K4. I had a day off today and Bruce thought he'd surprise a couple of X1 drivers by sitting outside with his feet up - yes really, the joys of being retired ! The driver of 37565 wasn't in the least bit surprised - it was Des after all. Only 13 out of the 17 B9s were in service on the X1 today, leaving 6 turns to be covered by other buses. 37564 was out on the 14.08 Lowestoft to Norwich X2 and 37568 was at Lowestoft for servicing. Various afflictions continue to dog 37566 which was failed in the early hours with a fuel supply fault and this was towed away to Volvo this morning (see picture) where it was quickly repaired in time for it to return to Yarmouth and do the 6B/881/X1 (17:25 ex Lowestoft) sequence. 37573 was under repair at King's Lynn. The shortfall was covered by 37156/7/9 and 20107 on K2, 20121 on K3 and 34108 on Y13. This meant two consecutive turns were coach operated. 37567 returned to X1 use yesterday and worked K1 today. Punctuality was hit and miss today with 37569 on L11 being 14 late westbound this morning. 37563 in contrast was 3 early from Wisbech on the 12.48 to Peterborough. 37565 on L8 lost 12 minutes while covering Wisbech to Peterborough and back. 37157 on Y9 was 7 late from Wisbech at 10.25 and didn't come back, so probably got delayed and went empty back to Lynn from Peterborough. 37563 was returned to King's Lynn from Volvo today and was immediately put into service replacing 37158 on the 14.32 King's Lynn to Lowestoft (Y13). 37158 needs accident damage repairing, although it is not thought to be serious and may not have occurred today. Michael Bryant says 37564 with its noisy fan was being employed on a Lowestoft worked schools contract this afternoon and at Lynn, 37570 was sidelined with an air fault while 37160 was on locals. As a result of these absences, 20107 was again working on the route, it came out on L10, but itself was replaced by 37159 for the 19.50 King's Lynn to Peterborough. This had come in on Y9 and this was another turn which changed vehicles today. 37568 which did the morning part was switched at Lowestoft to do the 15.48 X2 to Norwich, making sure it was on hand for servicing tomorrow. 37158 on Y13 today seen from blog HQ with new Virgin advert. Virtually the whole X1 Gemini fleet had their adverts changed overnight and most now find themselves advertising BT Broadband Autumn Deals on the offside and rather ironically Virgin Speedy Broadband on the nearside ! 37563/8 & 37575 seem to be the only vehicles which the ad-men missed. Timekeeping was pretty good today but 37156 was an exception on K16 being seen by Rob Brooks 15 late on the 13.48 Wisbech to Peterborough, reduced to 12 late returning. On the other hand, 37576 was a minute early on K2 16.18 westbound. Not really X1 connected, but it did used to sometimes work the X2, the last remaining old Olympian at King's Lynn, 34876, was rescued from the back of Rowan Road compound today in preparation for moving on, reportedly for further use as a Playbus. Well today is Remembrance Day and do spare a thought for our war heroes past and present by observing the minutes silence if you can at eleven a.m. Yes it's 507 (or 20507 to be more accurate) on the Scottish version of the X1 a couple of weeks back. Since the return to traffic of 20121, it has faithfully returned to King's Lynn garage every evening. Tonight was different though. It had worked K3 as usual, but was seen by me approaching Walton Highway at 17.17 (due 16.35), so obviously there had been an incident of some kind. This then put it into the timings of a delayed K4 and it continued on this line going through to Lowestoft, then empty to Yarmouth as diagrammed. 37564 had been K4 in the morning, but it looks like 37157 took over at some point before 121 found itself deputising. 37157 itself had started early on K14, but was taken out at Lowestoft for a safety service, 37566 replacing it. The Beast worked K2 today and was on time both morning and evening, but punctuality varied today. 37563 remained at Volvo today and 37570 was sidelined at Lynn with an air problem. The X2 ran with a full compliment of Presidents today says Michael. Very strange goings on today. Michael B reports 37567 yet again on the X2, being seen on the 11.38 off Lowestoft to Norwich. There is obviously a restriction on it, as L11 was allocated 20107 which worked all day. 20121 did K3 (now there's a surprise - not) and Jon says he could have sworn that K4 19.35 Lynn to Lowestoft left with a coach. Now 37572 which had been on K4 was taken off at 19.30 for a scheduled safety service and the vehicle off Y9 - this should have been 37579 - was used to replace it. I suppose it is possible that 579 was failed for some reason and Yarmouth supplied a replacement, or maybe Jon was mistaken. I'd be surprised at the latter as he is seldom wrong about these things. The man in the know informs me that 37563 which was in Vancouver Avenue garage last night, has been sent off to Volvo for attention. 37566 on K14 was changed at Lowestoft for 37156. There was a blip early afternoon with 37577 on K15 running 8 late and 37156 on K16 12 minutes behind schedule. SATURDAY. I was absent from the area on Saturday until about 17.00. Fortunately, I had time to pop over to King's Lynn during the evening to catch up with events. Assuming nothing had changed, it looks very much like today was a completely low floor service and we haven't had that for a long while. K18 had 37574 taken off this afternoon, but 37160 looks like it was the replacement.L12 had a choice from 37567, 37157 or 'The Beast' so we should find out eventually what was involved. Tonight 37575 on K15 was replaced for the last trip by 37563 which had done K14. 37569 was fitted with a new wheel hub trip meter today, the first B9 to receive a third such device. SUNDAY. Not a lot to report today. 37564 is the latest B9 to suffer from the noisy fan fault. 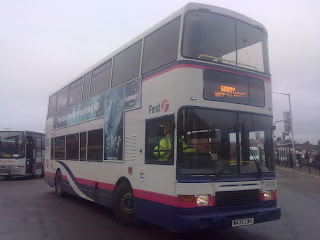 Recent examples have all been B7s and 564 is the first B9 for some time. Today it was replaced in service by 37568. Des was on X1 shuttles today and had 60865 for the 07:52 X1 James Paget Hospital to Norwich and 09.10 back to Yarmouth.His afternoon work included 34108 on the 16.40 Norwich - Gorleston JPH and he says "I held back departure by 5 mins because:- 37160 16:25 Nor > Low - departed 14 late @ 16:39". "Over here, Yarmouth Haven Bridge is closed every night till 12/12. There was a touch of FST this afternoon when K18 with 37159 was16 late on the 14.48 Wisbech - Peterborough and 25 late returning. 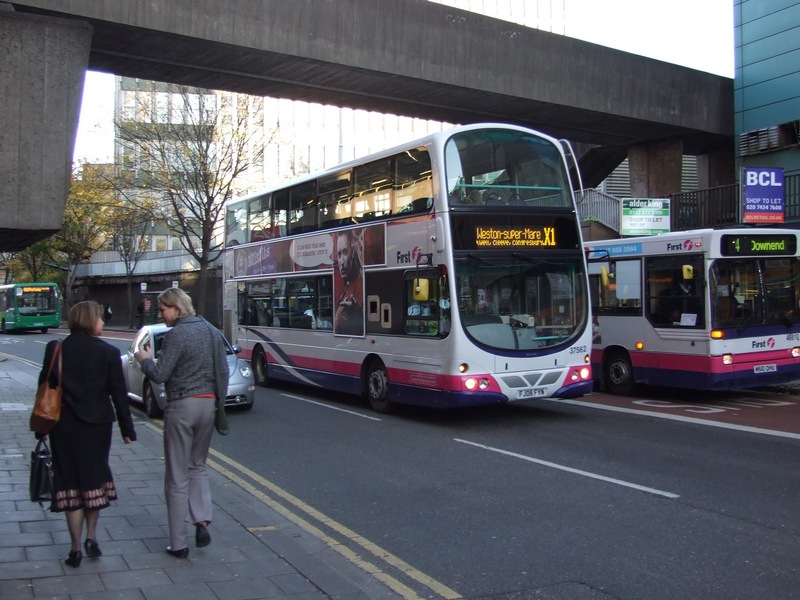 Earlier 20107 on Y6 was 8 late going west and 14 late returning, but overall delays were on average only in the region of 8 minutes. 37565 had a day off today for servicing at Lowestoft and sister vehicle 37566 was again off the road at Lynn for continuing modifications and an adblu fault. Michael B reports 37567 on the X2 for a second successive day. It did the 11.08 Lowestoft to Norwich. 37571 was another X1 absentee to permit servicing today. There were four out of five B7s out today as well as 20107 & 20121. 20121 with evidence of where its L plates were fitted, stands proudly in Vancouver Avenue after completing a week in which it worked K3 every day. A stranger in the camp. Today was the first day of King's Lynn using Optare Solos formerly operating in East London. Here Alberto fuels one amongst the usual B9s. 37578 off K5 and 37579 just visible off Y7 inside the garage. 37566 has had a couple of days off for scheduled modifications by a Volvo engineer. 37564 which had just arrived off L11 shows the damage to its milk advert. 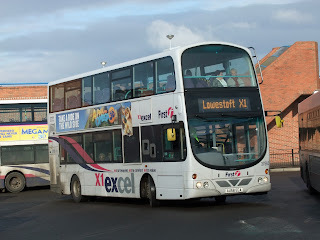 The only notable event today was over on the X2 where 37567 was provided for the 06.53 Lowestoft - Norwich which then goes empty to Beccles to work the 09..20 from there back to Norwich. It then did the 10.10 Norwich - Lowestoft. On the X1, 20107 worked K1 and by the afternoon it had lost 9 minutes, making it today's most delayed service. Everything else seemed to run like clockwork including 20121 on K3 of course. Lowestoft Gemini 37566 was kept in at Lynn for Volvo modifications today. Interestingly two years ago at this time, there were only 8 B9s yet in service, one of which was 566 and it had been taken off the road with collision damage. This took him a lot of time slaving over some cans of lager to produce, so well done that man ! Maintenance swaps with B9s resulted in several services changing vehicles at Lynn today. 37574 on L8 was removed for 37575 forward to Lowestoft at 12.02 and soon afterwards, 37576 was taken off K17 with (presumably freshly serviced) 37574 doing the 13.45 to Peterborough. A fairly quiet day compared to recent ones with the return of 'The Beast' on L12 as 37567 had servicing commitments. Punctuality was fair with delays of around 8 minutes typical around lunchtime. Des reports his duty for us : Y7 37563 - 15:42 Great Yarmouth to King's Lynn, departed 3 late @ yar (15:45), 4 late @ Nor (16:29), 14 late @ Dereham (17:19), 15 late @ Swaffham (17:42), 15 late arriving Lynn (18:22). K4 37569 - 19:35 Lynn > Low (then light to Yar) on time throughout. 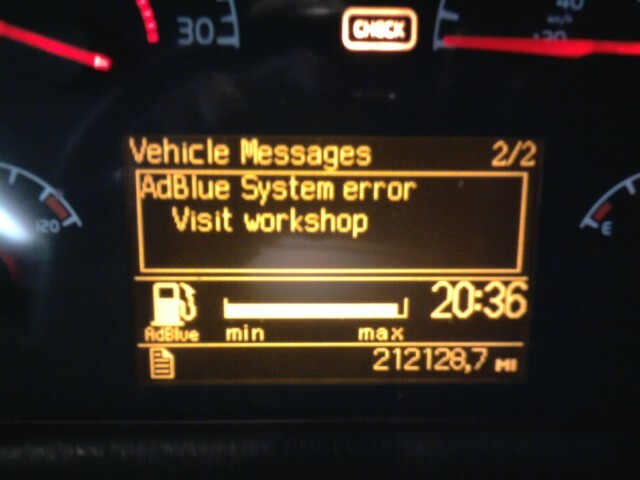 Adblue problems again. 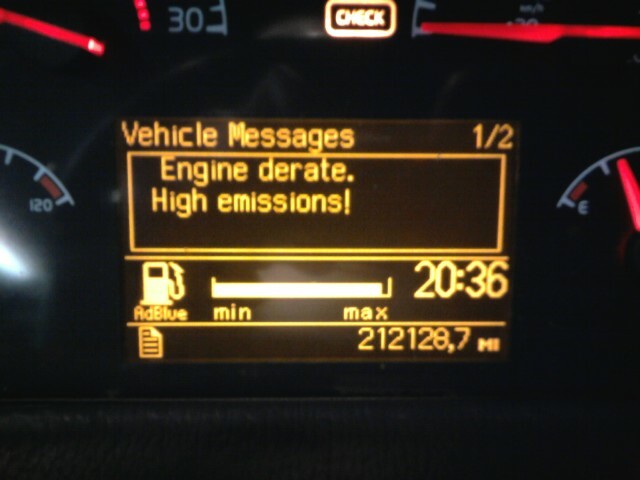 Ranging from 'No adblue - Engine derate' to 'Fill tank'. 20107 would have been 15:55 ex Norwich to Low and left passengers. 37566 - 16:25 ex Norwich, left passengers. We both left Norwich together. Petrol increased at Lynn = 119.9 - Low = 115.9 (Sainsbury @ Now = 113.9). Just in case any of you had forgotten, when you travel on a B9 Gemini on the X1, you are constantly being monitored by no less than 17 (I think that is the figure, but am willing to be corrected) security CCTV cameras. Now don't get me wrong here, I think it is an excellent idea, as unless you have something to hide, it shouldn't bother you - after all 'First' are hardly likely to show footage to the police of someone picking their nose !! Oh dear, I'm getting out of my depth here, I'm not suggesting that readers of the X1 blog pick their noses whilst travelling, or at any other time for that matter, but you get my drift. Anyway, what I'm leading up to here is the fact that 37568 (yes, the one with that unenviable reputation for late running) has been sidelined since Saturday afternoon simply because of a fault with its CCTV system. Such are the pitfalls of having such hi-tech buses I suppose ? 568 has been sitting in Vancouver Avenue during this period awaiting attention. Another problem of a different kind today involved last nights late arrival from Peterborough, 20115, and exactly what to do with it. This was soon resolved in the 'last in, first out' mode and it was used on the first eastbound departure today, K14, which ends at Lowestoft. For subsequent events with 115 see Des' report below. In a clever ploy, Richard sent 37158 out on K16 to enable modifications to be carried out on Lowestoft's 37567 and the latter was then able to replace 37158 for the 16.02 to Lowestoft. 37571 had a break from its regular turn of K17 today and instead appeared on K15, another Lynn internal diagram. 20121 continued its remarkable renaissance on K3, but was clearly delayed at some point. It was 5 late into Wisbech for the 08.56 to Lowestoft, but this evening was running 26 late on the 16.15 from Lynn to Peterborough. Whatever had delayed it had a lesser effect on K4 following and 37566 was only 7 minutes late. This gives a far from accurate picture of punctuality today though, which was overall very good. Peak hour morning services from Peterborough are usualy a few minutes late, but K4 with 37566 somehow managed to arrive in Wisbech a minute early today. Not content with this, 20107 then worked the 19.15, 21.15 and 23.15 99 to Southwold followed once again by the 0040 return from Bernard Mathews. It's good to see she doesnt just sit around out of use when not required for X1s". Indeed it is Syd and proof that you can't keep a good bus down ! I noticed recently that 107 now has a hub meter to record its mileage, not unique for a B10M but certainly something that is associated with more modern types. Des reports Y7 with 37569 at 15:42 from Great Yarmouth to King's Lynn : 7 late departing (15:51), 6 late @ Norwich (16:31), 15 late @ Dereham (17:20), 15 late @ Swaffham (17:52) 15 late arriving Lynn (18:22). Once again K4 was the duty back and as we've already said 37566 was on this turn, however, despite keeping time throughout, 566 was plagued with fault messages indicating adblue problems and engine derate. Maybe this accounts for it being the lowest mileage B9 in the X1 fleet. Other news from Des involves 37579 which Michael Bryant had seen on the 12.08 X2 out of Lowestoft and which Des confirms as being the 16:40 X2 ex Norwich. Delinquent 37156 was repaired and worked the 15:20 6B, then 881, then 17:25 X1 short out of Lowestoft. 20115 on K14 was insufficient to house the lengthy queue waiting at Norwich at 16.55 and on arrival at Lowestoft was collected by a Yarmouth fitter who had brought 37156 the other way. 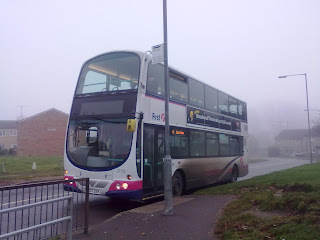 Back on October 9th, we reported the rare appearance of B10M 20115 on the main X1 service. On that occasion though, traffic problems saw it only reach King's Lynn before returning home. 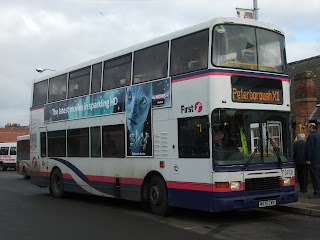 Today however, it travelled the whole route and did Y13 in its entirety, this forming the last bus from Peterborough back to Lynn at 23.10 having already worked the 13.05 Peterborough - Lowestoft earlier in the day. 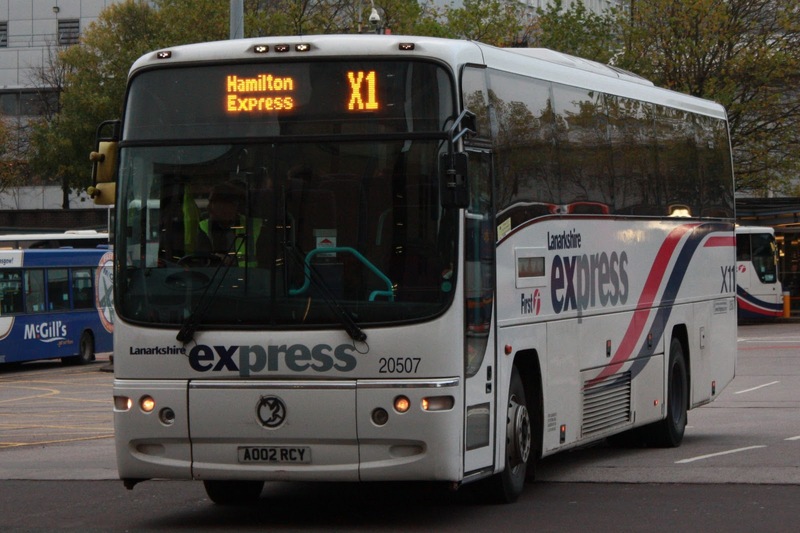 It was also the most delayed X1 seen today and was 13 late at Walpole Highway heading to Peterborough at 12.16. That being the case, I settled for getting a picture of it leaving Wisbech on the 13.56 to Lowestoft - that singularly failed though when I expected it to be still running late and it passed me dead on time. Bruce though was successful and here is his picture. ﻿Steven said the driver of 115 this evening seemed to be struggling to get it into gear, but it survived the day. The reason for 115s appearance was the non-availability of 37156 at Yarmouth. 20121 was on time am & pm with K3, but the rest of the service was low floor Geminis. Timekeeping was excellent today. Syd says "We thought you may like to know of the unusual day 20107 has had. It started with the 881 school service relief Carlton Colville to Flegg High School, Light to Lowestoft, then the afternoon trip to Bernard Mathews and back from Lowestoft with James driving. It then did 1803 X2 Lowestoft - Beccles, back light, before working 2315 99 to Southwold and light to Bernies to bring the same people back home it originally took out, at 0040 on the 2nd Nov". Below is one of the finest bus night pictures I think I've ever seen, it was taken at 2045 at Gordon Road by James. 37571 is about to depart on X1, 37576 was having it's hours rest, 42445 was on the 2115 ser 99 to Southwold and 20107 was lurking about to take the exhausted James home in just over two hours time. ﻿ Des reports his duty today : "Y7 37570 - 15:42 Great Yarmouth - King's Lynn, 6 late departure (15:48), 3 late @ Norwich (16:28), 8 late @ Dereham (17:13), 8 late @ Swaffham (17:45), 8 late into King's Lynn (18:15). After my break I drove 37569 - K4 19:35 Lynn to Lowestoft, then light to Yarmouth - on time throughout (Haven bridge is closed westbound, diversion via A47 & A12). Note:- 'First' were very lucky in Norwich this afternoon - At 16:27 the short run Norwich to Gorleston at 16:40 pulled onto a very full bay 4, just behind it was 20115. If 20115 were to have been on time, then it would have never have cleared the queue. 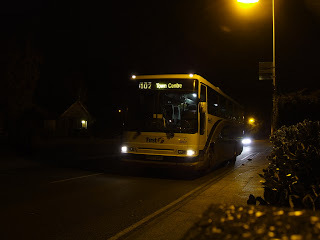 I also passed 20115 westbound in Dereham @ 20:40. Tesco petrol watch - a 2p increase in Lowestoft - 116.9 low - 118.9 lynn. This is the last full week of Blackpool Illuminations - Sitting in the cab of an X1 can be very illuminating! 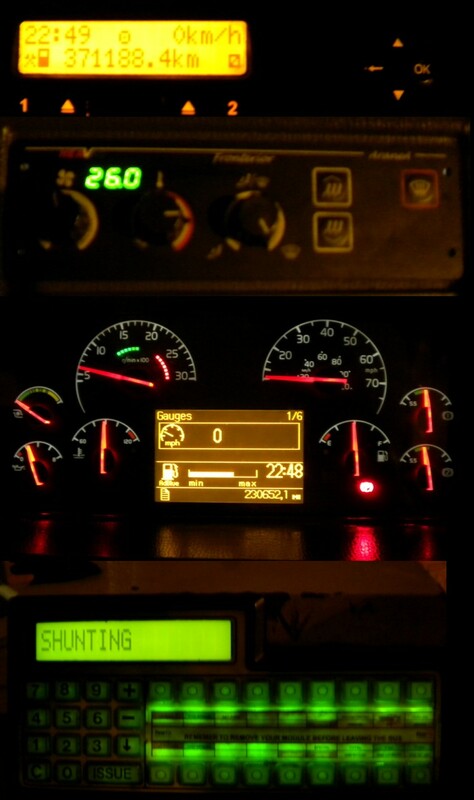 - Pictured right are just some of the instruments alight. When driving in the dark there is also a ghostly image of yourself reflected in the windscreen!". Thanks for that Des, I think all our readers will join me in saying that the X1 drivers are very special with all they have to put up with - and I don't mean me and Bruce taking their photos in action. The language barrier with some of the punters must be quite daunting alone, let alone keeping the more unruly passengers in line. Give yourselves a pat on the back ! 37575 is the only B9 to not have rear advertising due to a broken frame. It is seen pasing Walpole Highway today. 37564 was the bus provided by Lowestoft today. Just visible in this shot is the broken advert for milk which has been removed from the other B9s which carried it. By the Beast that is ! Despite it being a Sunday, Great Yarmouth is always the point of interest as Lynn and Lowestoft always have plenty of spare buses. Yarmouth end up with Saturday X1 arrivals off K1, K4 and K18 plus the bus which travels light from Lowestoft off L12. Of these only three are required on Sunday, theoretically leaving one spare. Yesterday arrivals were K1 (37579), K4 (37574), K18 (37156) and L12 (20107). Des says "37156 failed - indicator stem broken and sitting very low on rear suspension, so 20107 had to come out instead". 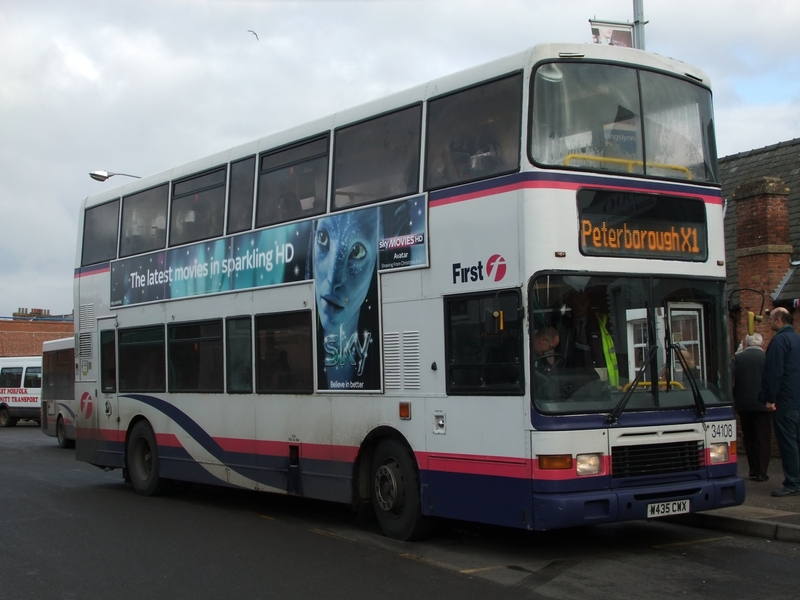 107 was actually used on Y9 09.30 Yarmouth - Peterborough. It continued back to Lowestoft where it was replaced by 37577.